Although regular readers probably don't need reminding, I am an unabashed fan of Courtney Barnett. I rated her The Double EP: A Sea of Split Peas in my top ten for 2013 (link) - the year before its US release), and have followed her career arc with interest since. I'm also aware that a lot of ink - digital and real - is being spilled to cover the release of her debut LP, and associated live shows, so I could be lazy and write "great album, you should own it". But I strive to be helpful, so while I'll spare you the detailed discussion of her background you can get elsewhere, here are what I think are the two most noteworthy aspects of Sometimes I Sit and Think, and Sometimes I Just Sit. The first thing to note, not because it is the most important aspect of the album, but because the sequencing of the songs serves it up first, is that this is a rock album. You will read much justifiable praise for Courtney's storytelling, adept turn of phase and Dylanesque singing style, but Courtney also is well able to rock your socks off or inject you with a shot of blues. The electric guitar in her hands is not a PR-generated adornment, and she has played guitar in other bands, including Melbourne's Immigrant Union. Opening tracks "Elevator Operator" and "Pedestrian At Best" raise a righteous ruckus of crunchy and slashing guitars and pounding rhythms. And perhaps the best example is the guitar work on "Small Poppies". Of course, there are a number of shaggy stories told with less volume as well, such as the country inflected standout "Depreston", but suffice it to say that this record doesn't belong in the "singer-songwriter" or "folk rock" bins. Not surprisingly, the most notable feature of the album is the songwriting. In my view what makes Courtney's songwriting special is not just the stories she tells, and not just the unique twists -- the punchline, if you will -- but the organic way the story unfolds in her hands. "Pedestrian At Best" is a push me-pull me ramble of up and down feelings, including what seems be be a laugh at her own recent fame with plenty of side observations. An example of the unique twists she writes is illustrated by "Aqua Profunda! ", in which the narrator tries to impress the swimmer in the next lane at the pool but holds her breath too long, passes out and discovers the object or her interest departed by the time she recovers. "Elevator Operator" addresses a man who snaps in the middle of his morning commute and heads to a potential suicide spot on the top of a building. Along the way we learn of his worries about going bald, and the fashion choices and vanity of the woman waiting alongside him for the elevator. In "Dead Fox" Courtney begins by expressing skepticism about the merits of buying organic vegetables, then transitions to the sight of roadkill ("a possum Jackson Pollock is painted on the tar") and then notes that her hay fever is acting up and they may be one sneeze away from swerving into a passing truck. I think the best example of the organic flow of a storyline is in "Depreston". The opening theme is Courtney and her partner, frustrated in finding a home to buy, thinking about looking further out from the center of town (leading to the title of the song, a combination of the town's name -- Preston -- and the depressing feeling it evokes). But in talking herself into the merits of the venture Courtney observes that at least looking out farther might get them away from all the coffee shops, leading to a discussion of their wonderful new coffee machine and how much money she is saving on coffee. The house hunt leads to discussion of the life of the previous owner and a rant about the high cost of housing. I love diversions like this because this is how we think, this is how we tell stories, and this is how we live our lives. Our focus is rarely on just one topic for one period of time, then shifts to the next one with no random thoughts. 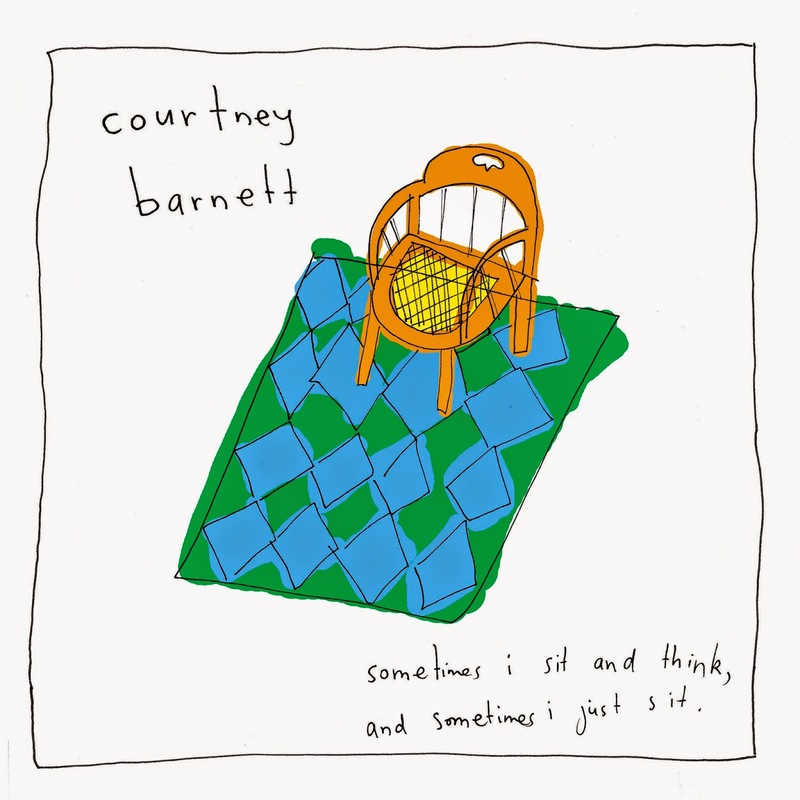 Courtney's ability to capture the essence of the wandering thoughts and and multiple facets of daily life give the songs depth and warmth that is all too rare. Of course, there will be many good albums this year. But in my view this is one of the best so far, and will stand as one of the best when the year is done. In addition to Courtney (guitar), the band for this album was Dave Mudie (drums/percussion), Bones Sloane (bass) and Dan Luscombe of The Drones (guitar). Everybody sang. The album is out now. The US label is Mom + Pop. In Australia it is out on Courtney's own Milk Records and in Europe via Marathon Artists. You also can order via Courtney's website and at the usual digital outlets.